There are two new Generals leading the armies in the Soul Wars Starter Box. Join us as we take a look at each of their rules to see what they do on the tabletop. 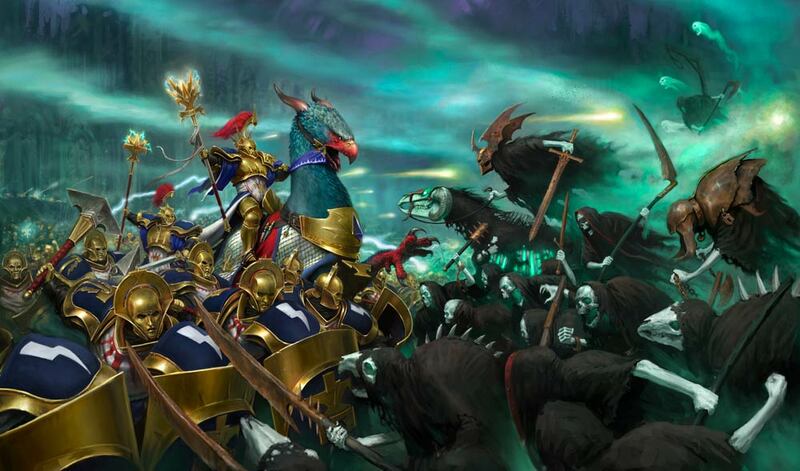 The Stormcast Eternals are getting a new Chamber and the Nighthaunts are getting “fleshed out” as a faction in Warhammer: Age of Sigmar – Soul Wars. Each of these factions is making their debut with a ton of new models. We’ve got our copy and have been excitedly building and painting them to showcase next week. But in the meantime, we’re taking a closer look at the defacto leaders for each group. 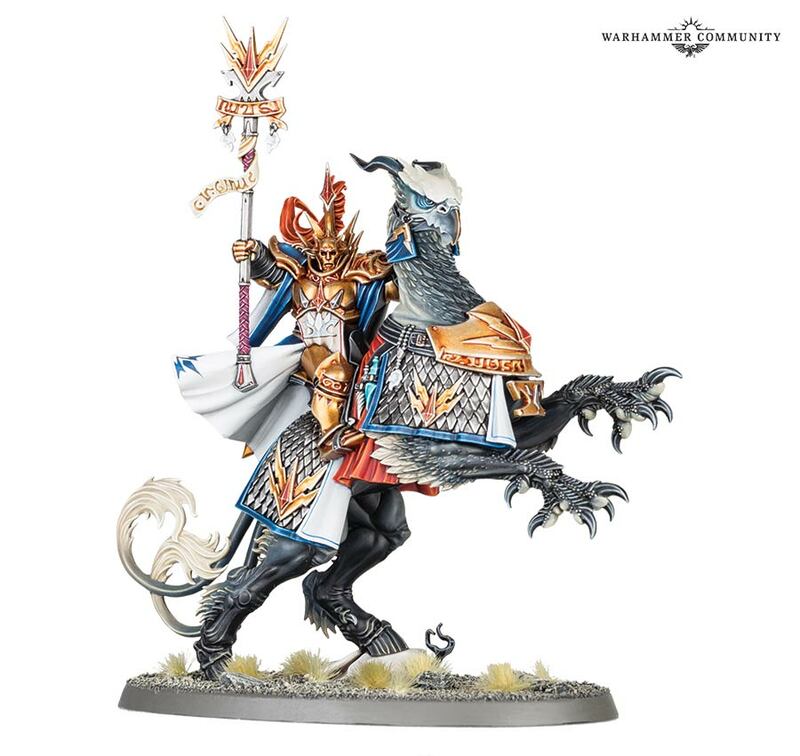 Up first we have the Lord-Arcanum on Gryph-Charger. He’s a pretty heavy hitter that can move relatively fast with a chunk of wounds, a strong save and some good abilities. Comparatively, he’s pumping out more attacks and has a higher damage potential than his boxed-set counter part. However, he clocks in at almost double the points cost as well. 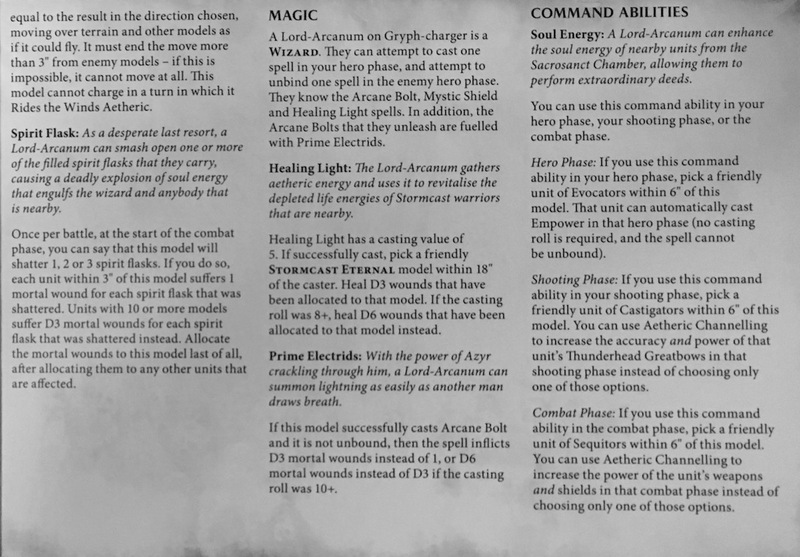 As you can see from the abilities section, the Lord-Arcanum has quite the list. The tactical toolbox this unit brings to the table is pretty impressive. It has ways to generate Mortal Wounds, heal damage, and buff your army. 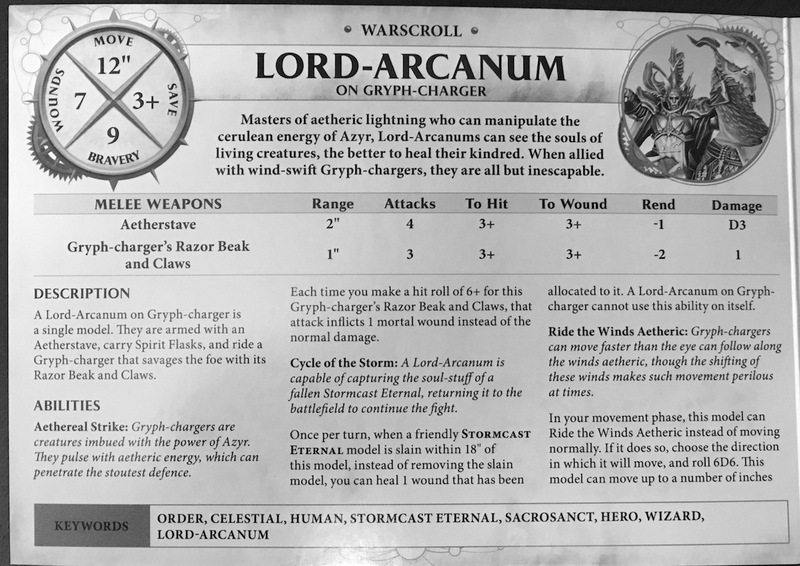 The Lord-Arcanum is a strong choice to lead your Stormcast Eternals in the Sacrosanct Chamber. 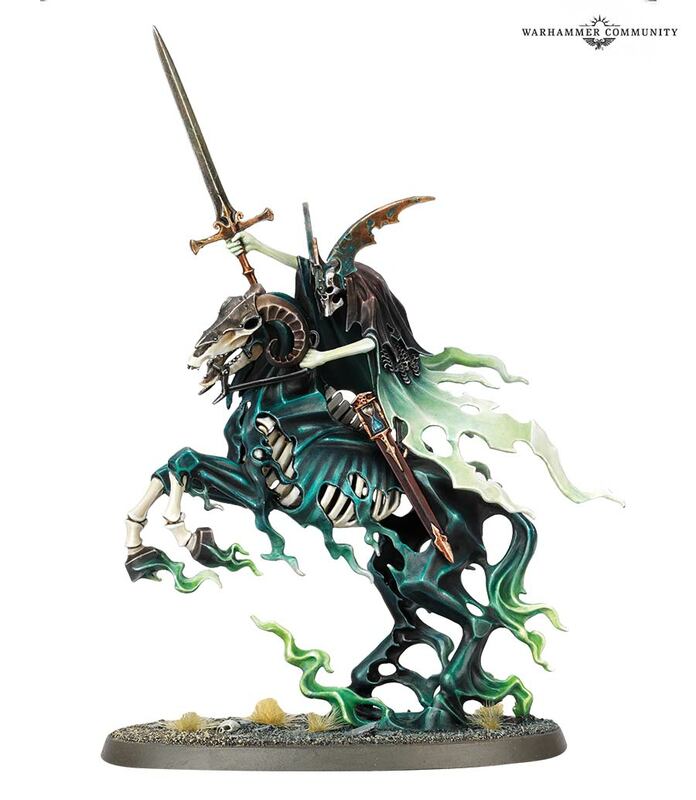 The Knight of Shrouds is back and this time he’s on an Ethereal Steed. It’s not as killy as the Lord-Arcanum, but it’s deadly in it’s right. The Sword of Stolen Hours is actually pretty solid with 4 attacks that each do a flat 2 damage with a -1 rend. 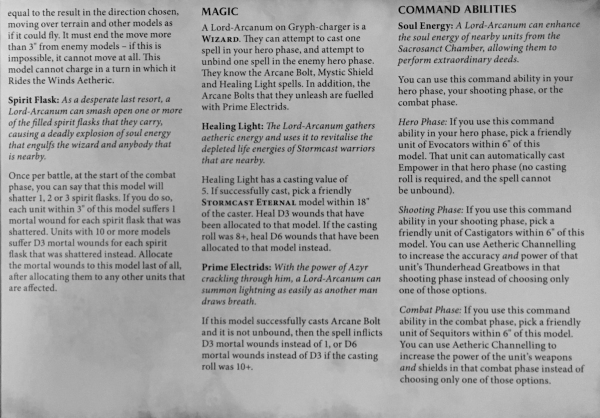 It also allows the Knight of Shrouds to regen lost woulds which could come in very handy. His ghostly steed is not great, but it’s no slouch either. What really makes him interesting is that he can Fly and ignores modifiers when making save rolls. Last but not least, he can make your Nighthaunt units get bonus attacks. With the right combo, you could really do a number on Sigmar’s golden boys & girls. If you’re looking at it from a straight-up stats point of view, the Lord-Arcanum seems like he’s just better. 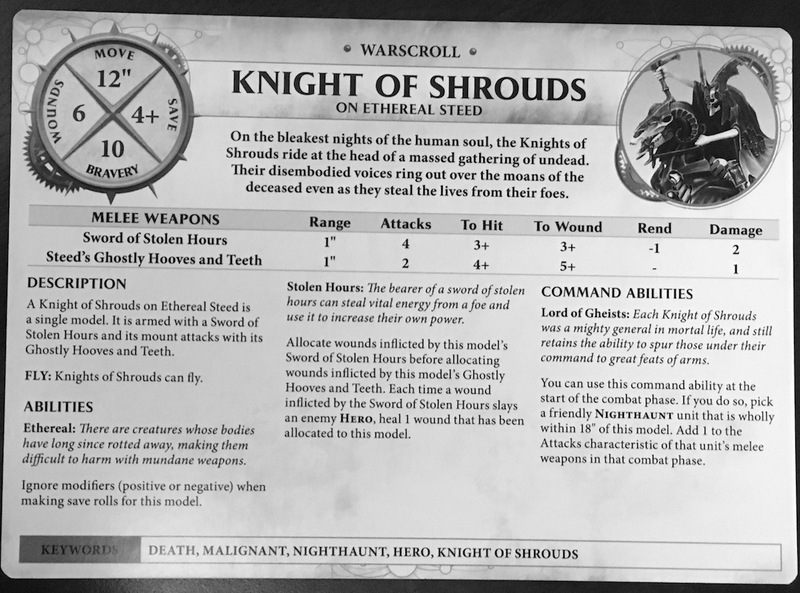 Heck, even if you add in the utility of what they each bring to the tabletop, it’s hard to argue that the Knight of Shrouds is in the running. However, the dead don’t rest easy and they typically bring friends. The fact that the Knight of Shrouds is 100 points cheaper is hard to ignore. When you factor in what you can do with an extra 100 points, suddenly the battle is looking a bit more in favor of the Knight of Shrouds. How will these two work when they are pitted against each other on the tabletop? We’ll find out on Monday!